Setting up a tent for general conference is the best idea ever! Now, where can I roast these? President Russell M. Nelson1 announced seven new temples during April 2018 general conference, 2 has studied Mandarin (the language of China), and 3 was a heart surgeon. 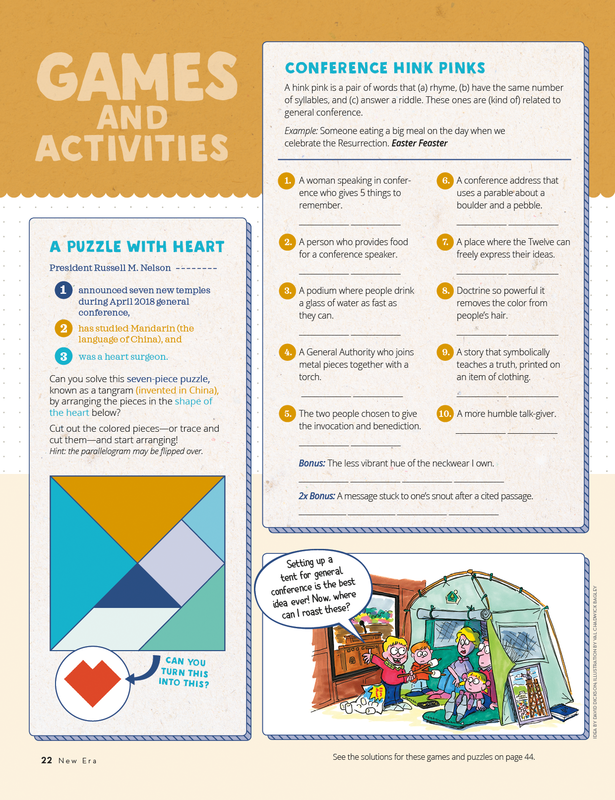 Can you solve this seven-piece puzzle, known as a tangram (invented in China), by arranging the pieces in the shape of the heart below? Cut out the colored pieces﻿—or trace and cut them﻿—and start arranging! Hint: the parallelogram may be flipped over. A hink pink is a pair of words that (a) rhyme, (b) have the same number of syllables, and (c) answer a riddle. These ones are (kind of) related to general conference. A woman speaking in conference who gives 5 things to remember. A person who provides food for a conference speaker. A podium where people drink a glass of water as fast as they can. A General Authority who joins metal pieces together with a torch. The two people chosen to give the invocation and benediction. A conference address that uses a parable about a boulder and a pebble. A place where the Twelve can freely express their ideas. Doctrine so powerful it removes the color from people’s hair. A story that symbolically teaches a truth, printed on an item of clothing.